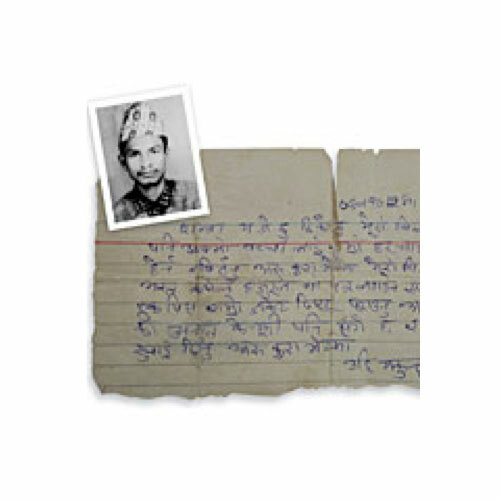 In December 2003, during a trip to Kathmandu, Mukunda Sedhai was arbitrarily arrested by plain-clothes men while he was playing cards at a tea stall. It is now known that he was detained in Chhauni Army Barracks, where he told a fellow inmate that he was beaten and tortured so badly during his first few weeks in detention that he could not stand up and had to be taken to hospital. There have been no reported sightings of him since mid-February 2004 and his whereabouts remain unknown. In 2004 and again in 2005, Mukunda Sedhai’s wife, Shanta Sedhai, approached the courts to request the release of her husband, but officials repeatedly denied that he was being detained. In June 2007, the Supreme Court issued a decision directing the police to investigate the case. ShantaSedhai also approached Nepal’s National Human Rights Commission, which conducted an investigation into the disappearance, and concluded that he had been arrested by Army personnel. In 2008, after no progress in the case, Shanta Sedhai, represented by Advocacy Forum Nepal and supported by REDRESS, filed the case to the UN Human Rights Committee. The Human Rights Committee decided the case in July 2013. It found that Nepal was responsible for Mukunda Sedhai’s enforced disappearance, violating numerous human rights including his right to life and right to be free from torture. In addition, it held that the anguish and distress caused to his wife and their two children amounted to prohibited ill-treatment. The Human Rights Committee recommended that Nepal carry out a thorough and effective investigation of the facts and provide the family with detailed information. If he is still alive, Nepal must release him immediately, and if he is deceased, it must hand over his remains to his family. Nepal must prosecute and punish those guilty and provide adequate compensation to the family and Mukunda Sedhai if he is still alive. In addition, it is required to take steps to prevent this from happening again and to translate the Human Rights Committee’s decision into Nepali and distribute it widely. No action has been taken. Mukunda Sedhai’s fate and whereabouts still remain unknown. Mukunda Sedhai’s family has only been provided with a small payment of “interim relief” provided to all victims disappeared during the conflict. Enforced disappearance and torture have still not been criminalised under Nepali law.